Call me crazy, which you are welcome to do, but I really enjoyed teaching myself how to make this from scratch and not from pre made masa. I am not knocking the other way by any means. I just found it rewarding to know how corn tortillas are really made. Well, this is how they all start, each one of them. No getting away from it, I find it fascinating! The chemistry between the two very simple organic ingredients makes one of the most widely used carbohydrates in the United States. Apparently without the cal, the maiz does not have a chance to release its most nutritional values. These antioxidants, vitamins, and nutrients are locked in each little corn pebble, if you will, and the cal holds the key to unlocking all of them. How cool is that? For more information on this awesomeness, Google the ingredients, it is very cool:). Loving Nixtamal! note: both dried corn and slaked lime (cal) are available online and in most Latin markets. 1. Start by rinsing the corn in a colander. Place the cal and water into a large pot, non reactive, on medium-low heat. Stir to combine. Add corn. Bring to a rolling boil over 45- 1 hour. Once it has reached a rolling boil remove from heat, and sit at room temperature over night. 2. Drain the corn in a colander and rinse under lukewarm water for 5 minutes while rubbing the corn between your fingers in order to remove the outer casing. 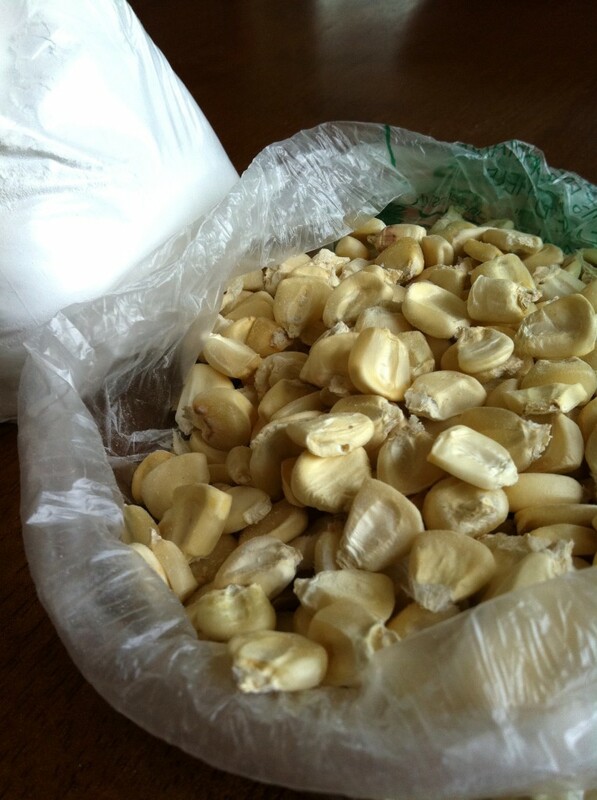 Put the corn into a large bowl, cover with lukewarm water, and allow to soak for 3 minutes. Drain the water, rinse, and repeat once or twice more.